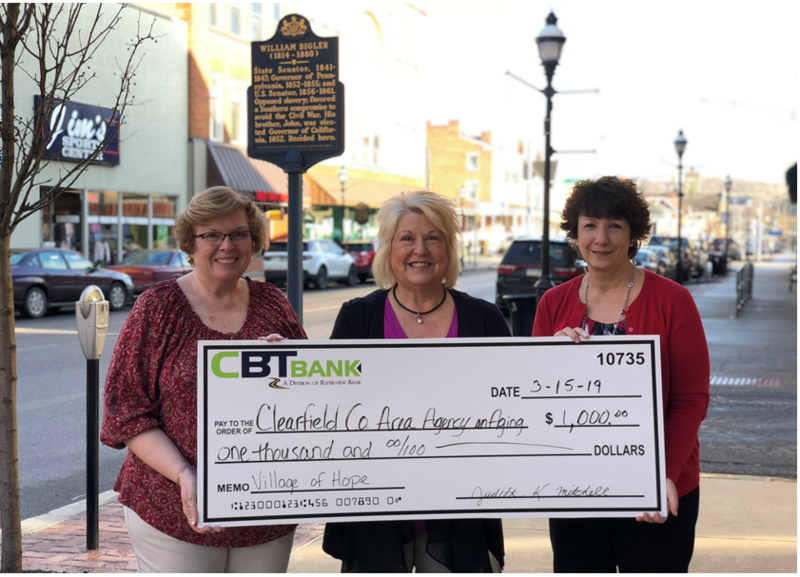 Judith Mitchell and Kathy Collins from CBT Bank, a division of Riverview Bank, presented the Clearfield County Area Agency on Aging Inc., and Mature Resources Foundation with a check for $1,000. Accepting the funds was Terry Khoury, coordinator of mission advancement and public relations, from the CCAAA. The donation was the first generous contribution for the Village of Hope. Located in LeContes Mills, The Village of Hope will be an inclusive community where older Pennsylvanians, particularly those with dementia and other cognitive impairments, can live independently and maintain their quality of life and age with dignity and joy. It is designed to serve the people (of all ages) and serve as a resource for the greater community. Unlike institutional models of care, the Village of Hope works to connect, rather than isolate people and bring together people of different abilities and different cognitive, physical and creative abilities in the belief that the whole can be greater than the sum of its parts. This is a cutting-edge approach to home and community-based services, not a licensed health care facility. With an emphasis on reciprocity, everyone living, working and studying within the Village will be taught methods for communicating with and collaborating with and supporting people living with dementia. Housing options will include single occupancy, double and a small percentage of single-family homes. Although priority will be for eligible persons from Clearfield County, individuals from other counties will also be eligible. The Village of Hope will become a replicable model that can reduce expenditures from public programs while improving the health and well-being of people living with dementia, their families and the surrounding communities. It can change the way we organize and deliver supportive services in the context of dementia in Clearfield County, and across the country. For more information on the Village of Hope or how to support the CCAAA, please visit the Village of Hope Web site, www.ourvillageofhope.com.